Shrines are funny. Sometimes they are carefully engineered, with an esoteric architecture that speaks to the builder’s private relationship with the divine– and sometimes, they crop up out of nowhere, clusters of devotional objects gathering with a curious gravitational pull to any flat surface that has open space. Today’s Roundtable post is about the former: the kinds of shrines we create with conscious effort, as a launching point for our conversations with the gods. As always, there is no One True Way to build a shrine, but having a framework to guide you can be helpful. So, here are some steps I take when I decide to put together a shrine. Step One: Decide the purpose of your shrine. Shrines have a variety of purposes. Many shrines are designed for performing a specific ritual, such as Senut, a priestly ritual, or another daily devotion. These shrine typically have the tools needed for the ritual, as well as focal points for the gods to whom the ritual will be dedicated and any permanent offerings They have received (e.g. semi-precious stones or jewelry). Some shrines serve as a meditative focus for the god, but do not host any ritual. These often contain a small plate or bowl for offerings and a myriad of objects devoted to the god. Some shrines are meant not for the gods, but for veneration of one’s ancestors, or akhu. These often contain plates, cups, or bowls for offerings, as well as objects meant to represent one’s ancestors. Often there are photographs or mementos of loved ones gone West. Some shrines exist for the purpose of magic(k) or heka workings. These can take various forms, containing tools, ingredients, records and more. The purpose of your shrine will determine what you need. As an example, let’s imagine you want to create a shrine for your daily devotional rite, such as Senut. You first need to know what tools that rite requires. Most daily devotional rites include lighting of candles and incense and the making of offerings, so at very least you will need candles, an incense burner, and any offering vessels. If you make libations separate from your daily offerings, as in Senut, you will need a bowl and water vessel dedicated to those libations, and plates or bowls for any additional offerings you wish to make. You may want a cloth to lay underneath everything. You may also want an image of the deity we are honoring in this rite, or an object that will represent Them. 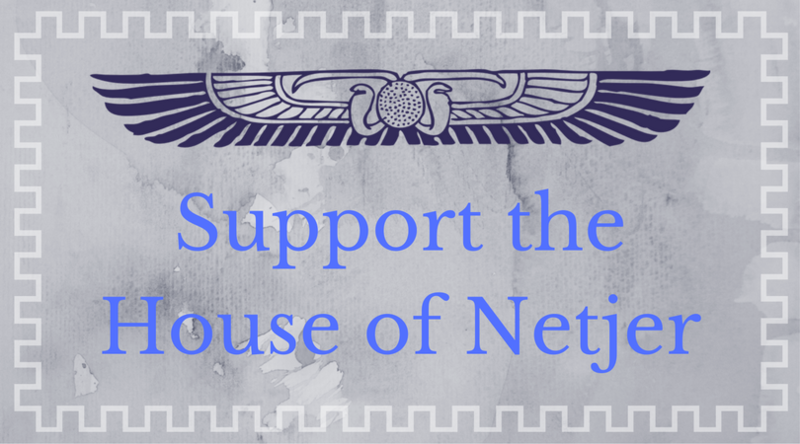 For this example, let’s say you are honoring Bast. 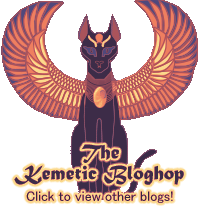 You may seek a traditional image of Bast, or use an object that represents Her – or simply leave the shrine blank as you prefer. How these objects are arranged depends on your comfort in performing the ritual. Try not to put candles and incense where you are likely to reach over them and set your arm on fire. Try not to put flammable things where they are likely to fall into fire. Use common sense and your own personal sense of aesthetics here. Step Two: Decide the level of purity of your shrine. Purity is important for some people, and less so for others. If you are creating a shrine for a ritual with a strict purity requirement, such as a priestly rite, consider using a cabinet or an enclosed surface for your shrine. If you are creating a simple meditative focus for a deity, any surface will do. The purity requirement often depends on the purpose the shrine will serve. 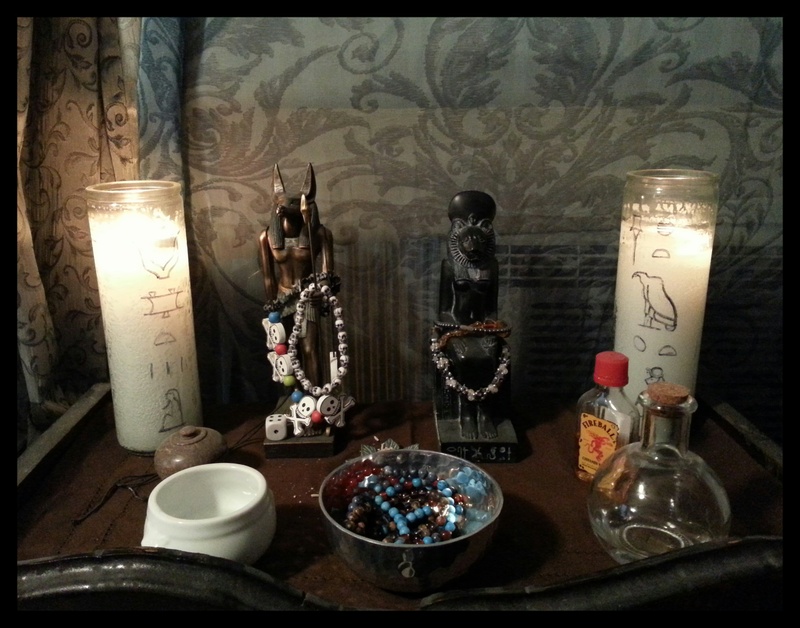 For me, my personal shrine is a cabinet – but the actual surface I use is the uncovered top of the cabinet, while the inside stores various items I use in rituals, and objects that I have offered to the gods over the last several years. My State shrine, however, is a cabinet I had specially made, with compartments to house the ritually consecrated Icons, and a covering over the surface I use for the ritual. I use my personal shrine for Senut and any other personal prayers I make, and I do not touch my State shrine unless I have made certain ritual preparations. My personal shrine, as of this post. Purity will also help you decide what you will and will not allow in your shrine. Even in my personal shrine, I do not allow plastic unless it is present in an offering a god has specifically requested (e.g. dice for Wepwawet). In my State shrine, I avoid plastics or other synthetics as carefully as possible. Some exceptions are required, but I divine for permission first and try to be as careful as possible. For this example shrine, let’s say you are going to keep a moderate purity restriction – avoiding things that are outright impure, but not requiring special purification to pray at or perform rites at the shrine. For that, you will probably be fine with any flat surface that has enough room for your shrine, and you may or may not want a covering for it. Again, all of these things depend on your comfort, and your relationship with the gods. Step Three: Get the shrine materials. This is the fun part – shopping! For a first shrine, you do not need to empty your wallet or travel miles to find a metaphysical shop. There are plenty of ordinary places to find excellent materials for one’s shrine. Many of my tools have come from the supermarket, retail stores, or department stores. For my personal shrine, I often shop at Target, Pier 1, Michael’s and A.C. Moore – retail, a home goods store, and two craft stores. Each of these has bowls, candle holders, and candles – all the basics. I particularly like Pier 1 for buying shrine cloths. I find their decorative napkins or placemats to be the perfect size and quality for my personal shrine. I also recommend kitchen supply stores, as they often have tiny bowls and pitchers, which can serve wonderfully in a shrine for holding offerings or libations. Be creative and open-minded – you and your gods set the limits for what you can and cannot do. Step Four: Profit — I mean, get your ritual on! The final step for building a shrine is to build it, and then use it. What primarily makes a shrine is its use. You may assemble a shrine, but if no devotion takes place there, it is nothing more than a collection of neat stuff. That use may be as elaborate as an hour of high ritual, or as simple as a quick morning prayer before you dash out the door. What matters is that the shrine becomes a place for you to connect with the gods. Shrines are the small spaces at which we “plug in” to our divine connection. They are the telephone jacks that connect us to communicating with the gods. What you need and what the rules are depends on your gods and your practices. If you are Kemetic Orthodox, there are specific tools and rules you will follow. If you practice any other path, those rules and needs are different. What you do at your shrine, however, is what makes it real and what makes it important. Next Post Back to Normal. I love the glass candle holders! Where did you get them? Heh, I actually made them. I bought a blank seven-day candle and drew the glyphs on. I did that before I saw that there were now Kemetic seven-day candle labels available or I’d probably have used those. In a way, though, I like this better. Very cool! What do the glyphs say? A wonderful, concise shrine guide by Sobeq. This was really well written. Very concise, very open to different paths, really just an excellent resource. Also, your current shrine is absolutely stunning! The Sekhmet statue in particular is so captivating, even just from a photo.